Tamiya 24319 a 1/24 Scale Lexus LFA Plastic Model Kit from Tamiya. Suitable for Ages 14 and Up. 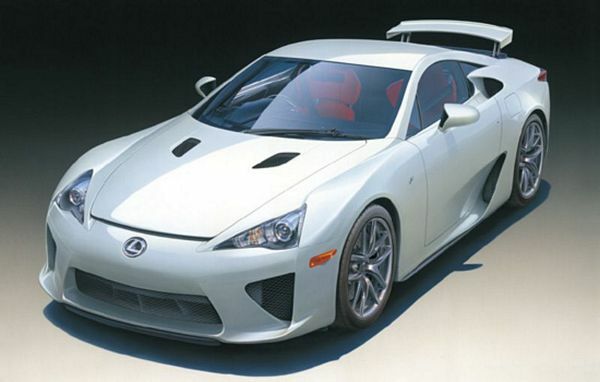 This is the TA24319 a 1/24 Scale Lexus LFA Plastic Model Kit from Tamiya. Suitable for Ages 14 and Up. Limited to only 500 units worldwide and coming at a bargain price of US$375,000 is Toyota's exotic sports car the Lexus LFA. Developed with the aim of creating a world-class supercar, the ultra-exclusive Lexus LFA is infused with the latest automotive technologies. It features a 4.8-liter V10 engine, a chassis equipped with a rear trans-axle, an interior which incorporates carbon fiber, and a sleek aerodynamic body. 1/24 scale plastic assembly model kit. The sleek, aerodynamic body design has been accurately reproduced. The front hood is open-able even after assembly. The Lexus LFA's motor has been accurately reproduced in rich detail. The interior and dashboard are faithfully reproduced. Model may be assembled with the rear wing in either deployed or retracted states. Magnets enable wing parts to be interchanged. Side mirror surfaces and the model's emblems are depicted with metal transfers. The light cases are depicted with gloss metal-plated parts for added realism. The front grille and mesh parts are depicted with photo-etched parts. Tires are realistically reproduced with synthetic rubber. Refer to the "Painting Markings" sheet within instructions for a full overview of exterior and interior color schemes.